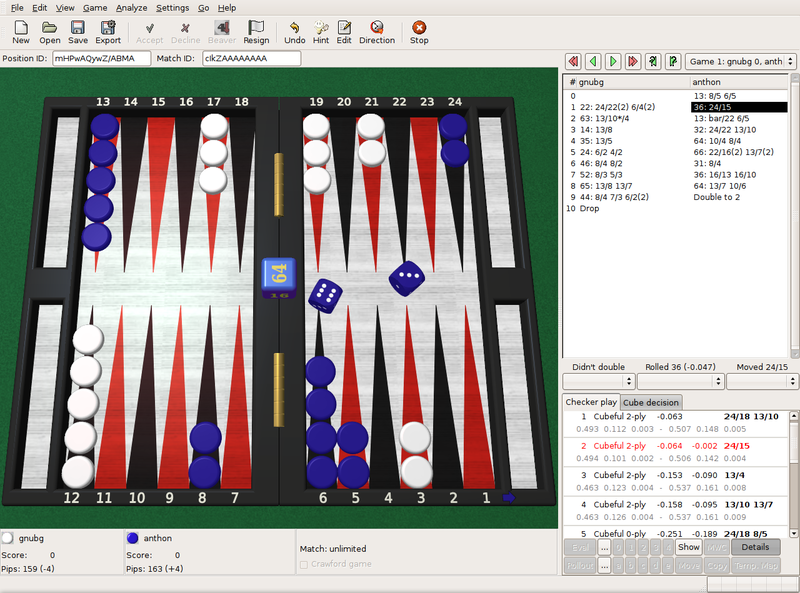 GNU Backgammon (GNUbg) plays and analyzes backgammon games and matches. It is able to play and analyze both money games and tournament matches, evaluate and roll out positions, and more. Driven by a command-line interface, it displays an ASCII rendering of a board on text-only terminals, but also allows the user to play games and manipulate positions with a graphical GTK+ interface. GNU Backgammon is extensible on platforms which support Python. GNU Backgammon is a world class opponent and rates at over 2000 on FIBS, the First Internet Backgammon Server. The following features can be found in the current release of GNU Backgammon. A command line interface (with full command editing features if GNU readline is available) that lets you play matches and sessions against GNU Backgammon with a rough ASCII representation of the board on text terminals. Support for a GTK+ interface with a graphical board window. Both 2D and 3D graphics are available. Tournament match and money session cube handling and cubeful play. All governed by an underlying cubeless money game based neuralnet. Support for both 1-sided and 2-sided bearoff databases: 1-sided bearoff database for 15 checkers on the first 6 points and optional 2-sided database kept in memory. Optional larger 1-sided and 2-sided databases stored on disk. Automated rollouts of positions, with lookahead and race variance reduction where appropriate. Rollouts may be extended. Automatic and manual annotation (analysis and commentary) of games and matches. Record keeping of statistics of players in games and matches (both native inside GNU Backgammon and externally using relational databases and Python). Loading and saving analyzed games and matches as .sgf files (Smart Game Format). Anonymous CVS access to the source repository is available. The current code is generally stable although less tested than the released versions. GNU Backgammon should build on any reasonably recent POSIX environment. The only mandatory prerequisite is the availability of GLib, version 2.8 or higher. Optional features may have more prerequisites, though. The source archive of the most recent release is gnubg-release-1.06.002-sources.tar.gz. GNU Backgammon is usually available as a binary package in Linux distributions and included in BSD and macOS ports repositories. To install it on Windows, use gnubg-1_06_002-20180802-setup.exe. The GNU Backgammon manual is available in the distribution, but bear in mind that this manual is still being completed and might not correspond to any particular version of gnubg. Please send comments if you would like to improve or extend the manual. Bugs, feature requests, patches, etc. should be sent to the gnubg mailing list or submitted using the bug tracker.